Tar Creeper is so much better. 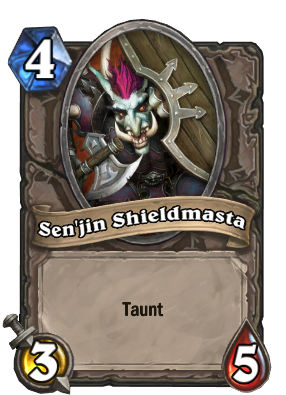 At 4 mana, reducing the mana cost by one pushes a 3/5 taunt over the top. Maybe this will maybe be played once [card]Tar Creeper[\card] rotates out. Tar Creeper is trash compared to this. Auto-include in most beginner decks? I remember back when our dear friend Tazdingo was the Premier Taunt minion, basically the Chillwind Yeti of Taunt, if you need a 4 drop and you already had Yeti, this is the card you went to. Now we have Bog Creeper, Sludge Belcher, Second-Rate Bruiser, Cyclopian Horror, Evil Heckler, Deathlord and Annoy-o-Tron, all fighting for the title of "Best Neutral Taunt in-game". Dear Sen'jin, sorry that we abandoned you so long ago for that slimy Sludge Belcher. Please join us in the fight again in Standard ranked wars! We will promise not to leave you again! Taz'dingo!! You need to hit level 59 and 60 with a rogue to get golden version of this bad boy. Tazdingo is hands down greatest basic card in existence, and it has one of the best taunts in the game as well. Turn 1 Yeti is the greatest combo involving basic card in game. I do agree with that, however Tazdingo is the greatest non combo based minion. I mean he normally always gets a 2 for 1 trade in the early/mid game. Totally agree. I'm running him in Wallet Warrior, even if I own every other taunter that could replace him. Taz'dingo! Yehehesss! Honestly one of the better minions for four mana. I agree. I think we often over look him because he's a basic. A lot of it is because of Piloted Shredder and, for taunt purposes, Sludge Belcher. (If you're playing dragons I guess Twilight Guardian is also better, but that's like 5% of the meta.) I still occasionally play this card though, over a year after Naxxramas and nearly a year after Goblins vs. Gnomes.